Although the beer is long gone, I’d still recommend camping at Newnes to anyone with a few spare days up their sleeves for some fun exploration, bushwalking and reminiscing on our hard working past. Those with camper trailers will find the steep and winding road through the Wolgan Valley reasonably easy to negotiate, followed by (weather permitting) well-graded gravel roads into the campgrounds. Nowadays, the ol’ pub at Newnes is officially a General Store and doubles as an information centre and seller of touristy items and other oddities. It has numerous photos and info on its walls that will keep you there for many an hour reflecting on the areas past. A new adjacent building incorporates a toilet block and an outdoors wood fired oven and BBQ area – perfect for socialising around on a cold country night. The Little Capertee campsite has two sets of long drop dunnies to choose from, but no showers or other facilities, so best be self-sufficient and bring your own everything, including drinking water. Other than one other caravanner, we had the place to ourselves, but one could only imagine the crowds during long weekends and school holidays. From the minute we parked on a flat patch of grass in the camp grounds, we abandoned all thoughts of a quick camp setup in favour of close-up photography of wombats, wallabies, ducks, plus there was a goanna that escaped our out-of-focus lens… hmmm… note to self to always leave the camera in autofocus mode! Some of the areas reputed animal species that we didn’t see this time ‘round were Quoll, Regent Honey Eaters, the yellow bellied glider and koalas. We did see however many other various birds that, from my non-expert knowledge of all things feather-breasted could have been anything from a Pelican to a Wedge tailed Eagle… or even a Rooster… bird watching (or bird species recognition) is certainly not my forte! We managed to see the giant wombat near the old hotel and even got a ride – great fun for the kids provided they don’t get bucked off! As well as watching all those pigeons... or perhaps ducks waddle about, we also lost track of time on our initial wonderings as we discovered relics of times gone by. A set of moss-covered brick stairs to nowhere had us wondering what the rest of the building may have been. The solitary brick and sandstone free-standing chimney that stood tall, even after all these years, had us pondering whose house it belonged to and the countless yarns the occupants would have told over a century ago... with cold beer from the pub to make the yarns all that more colourful. Once we realised how long we’d been neglecting setting up camp, we hooked in to setting up the camper trailer and sat back with a meal taking in the magnificent, sheer-sided sandstone cliffs that form the amphitheatre-like grounds we were lucky enough to be sitting in – life really doesn’t get much better than this! If you’re contemplating some of the main walks here, and you really should, you need to set aside plenty of time as the Glow Worm tunnel walk is an 8km return walk, and the Historic Ruins walk, while slated as a 2 hour walk, could set you back far longer depending on how much of the history you’re prepared to take in. This walk really is a testament to the hard working people of the time; there are countless brick retaining walls, parts of buildings and the many beehive shaped kilns still standing. There are plenty of informative plaques to read, plus the track is well signposted to weave in and out of the whole site and not get either lost or miss out on any of the main structures. The main walk was so well signposted we left navigation to our 4 year old boy to guide us through the maze of derelict buildings. He thought he was the ducks guts by pointing out each arrowed signpost he found. Some of the other walks are billed as ‘hard’ and ‘overnighters’, so backpacks, food, water and the usual camping gear should be carried. Back in the hey-days of 1903 to 1913, our government invested big time in extraction of oil from the local shale. Over the years and up until the late 1930’s and early 40’s, a handful of private entrepreneurs (and later again the government) had their turn at mining both this and nearby areas for shale oil, paraffin, kerosene and other products as well as being a staging point for a petrol pipeline. During our drive in, we noted on our fang-dangled GPS that there was a plethora of roads either side of the main track – none of which are visible these days as they are totally overgrown. If only they had the latest mapping resources we now have, life would have been a whole lot easier… or more complicated! 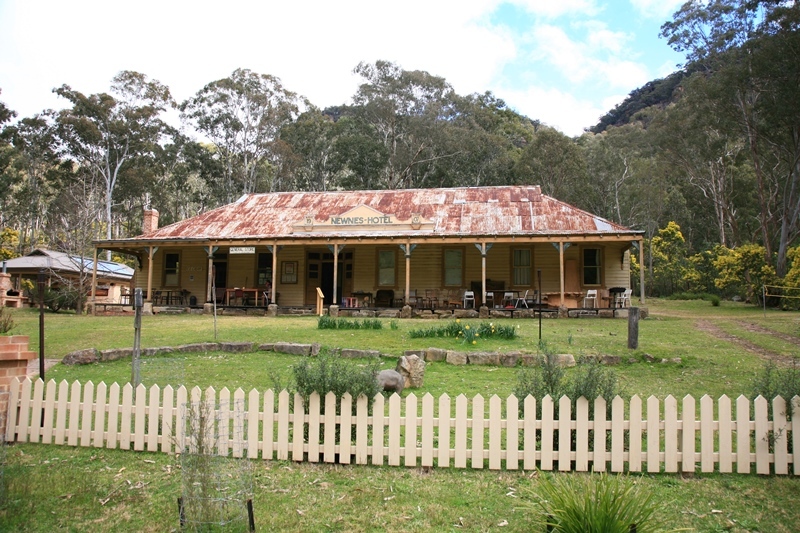 Coincidentally, in my past life as a surveyor, I had the opportunity to help with the moving of the historic Newnes Hotel in 1986, from its original resting place nearer the river, to its current and safer position on higher grounds. In hindsight, I wish I had been able to part of the historic assignment, as it would have been a fitting end to the mammoth job by having a cold ale as ‘cheers’ to all who helped and donated their time, energy and skills, as well as those hard-working fellas and sheilas with all the hard yakka they put in over a one hundred years ago. The official watering hole may not be dispensing beer now, but hey, the campgrounds are still a top spot for a cold drink. So, hit those long walks with gusto to work up a sweat, then be sure to kick back and relax with a coldie in hand while pondering the life and times of those that have gone before you over a century ago.